Since 2004, after the different publications of the Doing Business reports, the World Bank group cares about the relationships between common law and continental law. 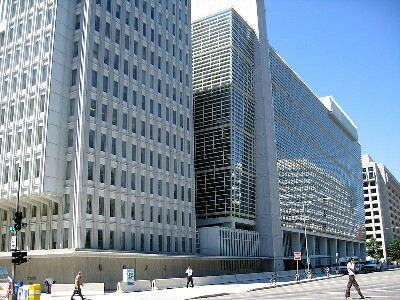 The World Bank holds that its assets into a competitive global marketplace are real. The International Board on Economic Regulations represented by Angelique Delorme held a Knowledge Café on Monday 16 Nov 2015. The working team consisting of Bruno Deffains, Catherine Kessedjian and Robert D. Cooter held a presentation about the Index of Legal Certainty on Thursday 19 Nov 2015: Legal uncertainty is a major issue for modern legal systems. Clear rules allow people to better predict the consequences of their actions as compared to vague legal standards. Thus, they contribute to produce the legal certainty and predictability required by economic development. However, one can observe different legal traditions and/or solutions around the world. 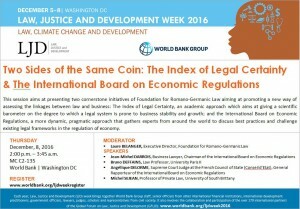 Based on a new Legal Index, the session aims to evaluate the level of legal certainty in different countries. The presentations discuss the legal and economic methodological aspects to evaluate legal certainty in a comparative perspective. By contrasting experiences from an original data collection in different countries, the panel extracts lessons for the design and implementation of laws in different legal fields (contract, liability, corporate, property, employment law and the settlement of disputes, which is subdivided into the courts and arbitration). The World Bank wants the MENA area states reform their business laws in order to make them more efficient and adapt them for the business international relationships. In this context, the World Bank is requesting the Foundation in order to realize some notes on the main reforms on the french business law. The Foundation has been asked to identify some answerings from 4 countries (Morocco, Egypt, Serbia, Lebanon) to a survey achieved by the World Bank to gather some information on the recent and current reforms and technics within the business laws from those countries.